The theme of Day 2 of the Mariners Eastern Washington Caravan was autographs. I had to stop signing for a good couple of minutes before I stopped laughing. I think Nick took the comment pretty well. The best moment of yesterday’s trip actually came after the day was over. We stopped at a grocery story following our final event in Moses Lake so we could get some snacks for our two hour bus ride to Couer d’Alene. Forgetting that he was still wearing his Mariners jersey from the recent autograph session, Nick casually walked into the Safeway store wearing his “Franklin #6” Mariners white uniform top. Within a minute, we were stopped by a fan in the produce section wanting to talk baseball. Needless to say, the jersey was then quickly removed. Day three starts in Couer d’Alene with visits to Spokane and Post Falls. Should be fun! Day 2 of the #Mariners Caravan with @nicholasefrank and the Moose is in the books. Fun time meeting all the fans in Eastern Washington! Day 1 of the Mariners caravan to Eastern Washington was really fun. First it was off to Summitview Elementary in Yakima where Nick Franklin, Dave Valle and myself talked to the entire school about setting goals, staying drug free, and studying hard in school. Of course, no matter what we said, the Moose was the most popular guy in the room. Then it was off to KTCR 980 where the three of us recorded some liners for our local radio affiliate. Val was a pro, and Franklin was pretty impressive, too. Our first day wrapped up at the Sun Dome where a few hundred Mariners fans joined us to talk a little baseball. After about 20 minutes of Q&A, it was time to break out the Sharpies. It was close, but I feel like Franklin was slightly more popular than me in the autograph line. He let me know about it on our ride back to the hotel. Day 2 is in Wenatchee. Should be a fun time! @nicholasefrank blowing minds on Day 1 of the #Mariners Caravan. 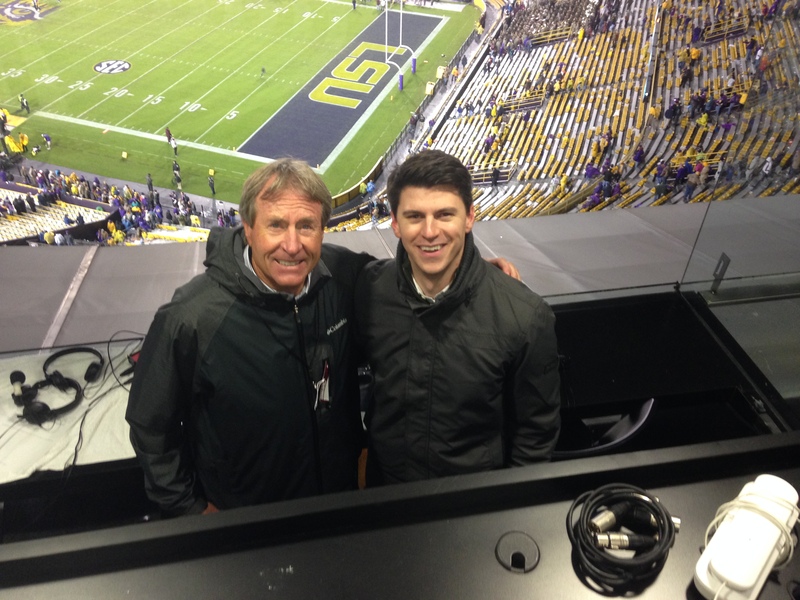 Former college football coach Gary Barnett and Aaron after calling the Texas A&M at LSU game in Baton Rouge. If you are watching a college basketball game over the next couple of months, you might recognize his voice. And when the camera is on the play-by-play guy, you might recognize his face. Aaron Goldsmith, Rick Rizzs’ new partner in 2013 in the radio broadcast booth, has a 10-game schedule of games on FS1 and in January-February will work 8 games on the Pac-12 Network. His next game will be this Saturday when Washington State hosts UTEP in Pullman on the Pac-12 Network. It’s quite an experience for Aaron for one interesting reason: his basketball broadcasting experience prior to this was two high school games several years ago and a couple of Providence College games for demo purposes (off-air). In addition, he has called the radio play-by-play of two major college football game on Sports Radio USA network (Texas A&M at LSU and Texas at Baylor), and will call the AdvoCare V100 Bowl (formerly the Independence Bowl) on December 31 in Shreveport, LA when the University of Arizona (Trey Griffey is a wide receiver for the Wildcats) faces Boston College. 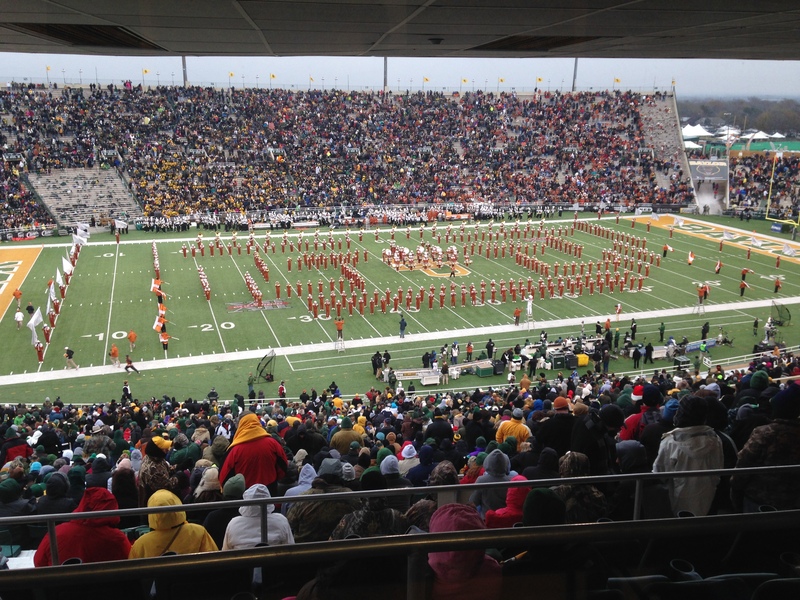 Aaron had the call for Texas vs. Baylor college football game in Waco, TX. His schedule in January and February includes games involves all four Northwest Pac-12 teams, the Washington Huskies, Washington State Cougars, Oregon State Beavers and Oregon Ducks. 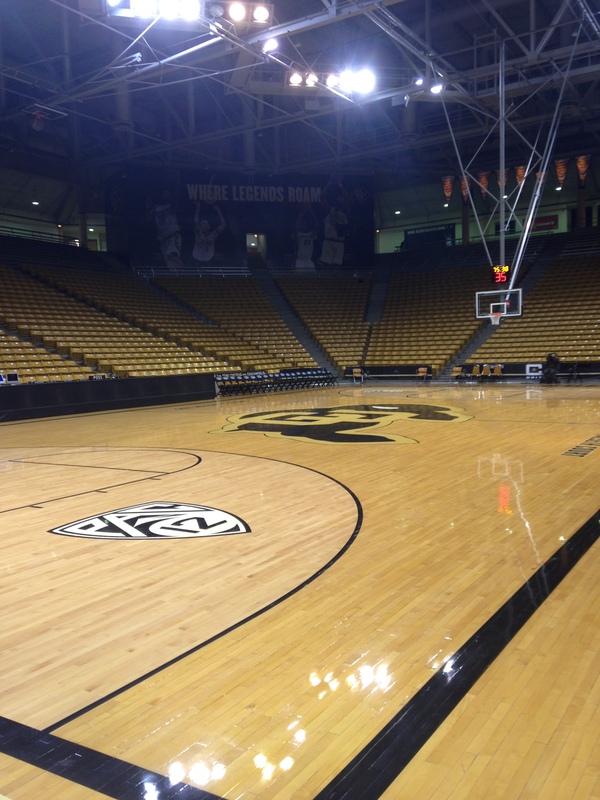 Aaron will call several college basketball games, including several stops in the Pac-12 (Coors Events Center in Boulder, CO pictured). Some fans may remember that in his first few seasons after moving to Seattle, Dave Niehaus broadcast several University of Washington televised basketball games. And several years ago, Rick Rizzs did some college football games for Fox Sports Northwest. Dave Sims, of course, has been behind the mic for NFL and college basketball games for many years. 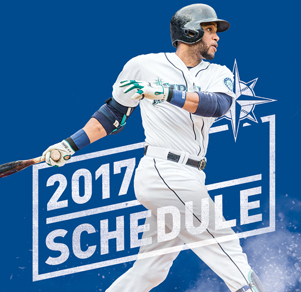 And here’s a quick reminder: the first radio broadcast of the Mariners spring training season will be Thursday, February 27, at high noon on 710 ESPN Seattle and the Mariners radio network. Brad Miller and Jeff Baker of the Rangers were both All-Americans at Clemson. Throughout the season, Mariners broadcaster Aaron Goldsmith will provide content on From the Corner of Edgar & Dave, giving a behind-the-scenes look at the Mariners players and organization. This post covers Nick Franklin batting leadoff for the first time in his MLB career, tonight’s pitching match-up between Hisashi Iwakuma and Derek Holland, and a Clemson connection. It will be interesting to see if Nick is leading off again Tuesday against Texas. When Franklin is seeing the ball well, he proved to be one of the more patient and effective hitters on the team. Through his first 35 games, the M’s second baseman hit .290/.350/.473. In his last 36 games Franklin is batting .177/.255/.355. It will be up to Hisashi Iwakuma to keep the Rangers off the board Tuesday night. He’s coming off his 13th quality start of the season, holding the A’s to three runs over seven innings on August 21. Talking with Iwakuma yesterday after batting practice (through interpreter Antony Suzuki), he said he threw less sliders to the A’s in his last start and more fastballs. When asked what makes his 90 mph fastball to effective, Iwakuma said it was because of how well he hides the ball in his delivery. Iwakuma will need to be especially stingy Tuesday. Texas starter Derek Holland has made three starts against Seattle this year and has struck out 26 batters over 19 2/3 innings while allowing just two earned runs (0.92 ERA). There was a Clemson connection Monday night at Safeco Field. Jeff Baker was in left field for the Rangers while Brad Miller was at shortstop for the Mariners. “He was a big reason why I wanted to go to Clemson,” Miller said. 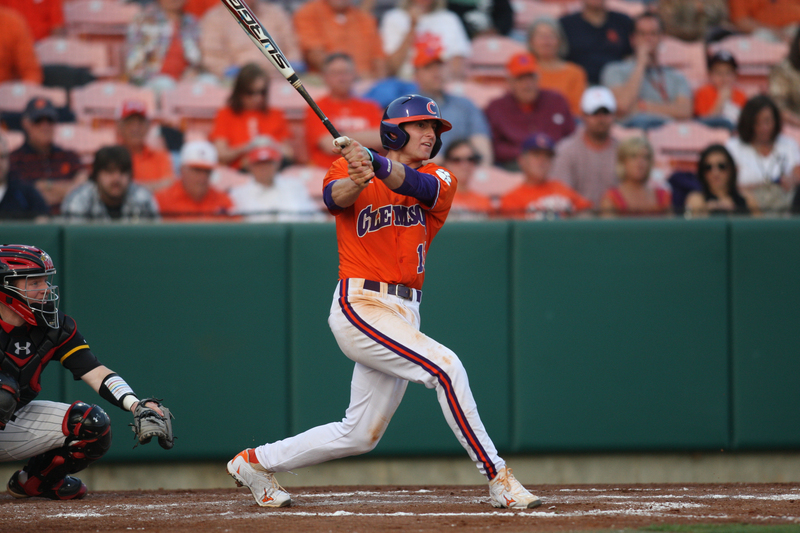 With 59 career homers, Baker left Clemson as the school’s all time home run leader and was part of the Tigers 2002 College World Series team with Khalil Greene and Michael Johnson. Manager Eric Wedge is greeted by broadcaster Mike Blowers. Throughout the season, Mariners broadcaster Aaron Goldsmith will provide content on From the Corner of Edgar & Dave, giving a behind-the-scenes look at the Mariners players and organization. Today Aaron writes about the return of Eric Wedge to the dugout and a recap of last night’s 2-0 loss to the Angels. 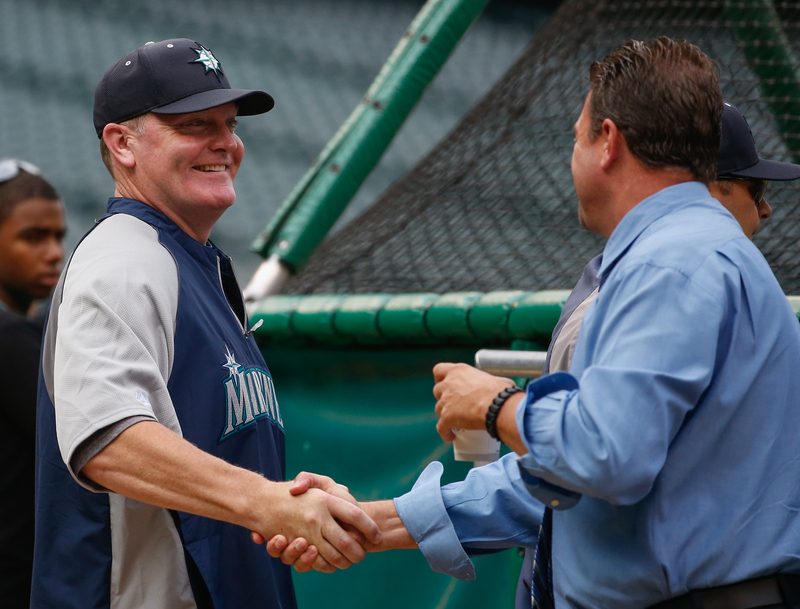 It sure was nice to see Eric Wedge back inside the Mariners dugout Friday night at Safeco Field. Mike Trout finished Friday night 0-for-4, snapping is MLB-best 40-game on-base streak. He’s a career .308 hitter vs. the Mariners, .441 vs. Felix, and finished 0-for-4 for just the second time versus the Mariners this season (14 games). Nice work Friday night by Carter Capps. After allowing 4 runs over his last three outings combined (3.0 IP), Capps worked 2.0 scoreless innings and faced just one over the minimum. His fastball had terrific life and it looked like he worked in his changeup a couple times, too. Watching Angels closer Ernesto Frieri pitch the ninth inning for his 27th save of the year, you have to wonder how many more he might have if the Angels were the reverse of their 56-71 record. He threw virtually nothing but 93-95 mph fastballs (with a couple sliders) and struck out the side. Had a brief chat with Mike Zunino Friday afternoon who (as always) seemed thrilled to simply be at the ballpark. Sidelined since July 25 with a broken hamate bone in his left hand, he said he caught two bullpen sessions, took some swings, and is hoping to participate in batting practice Saturday. 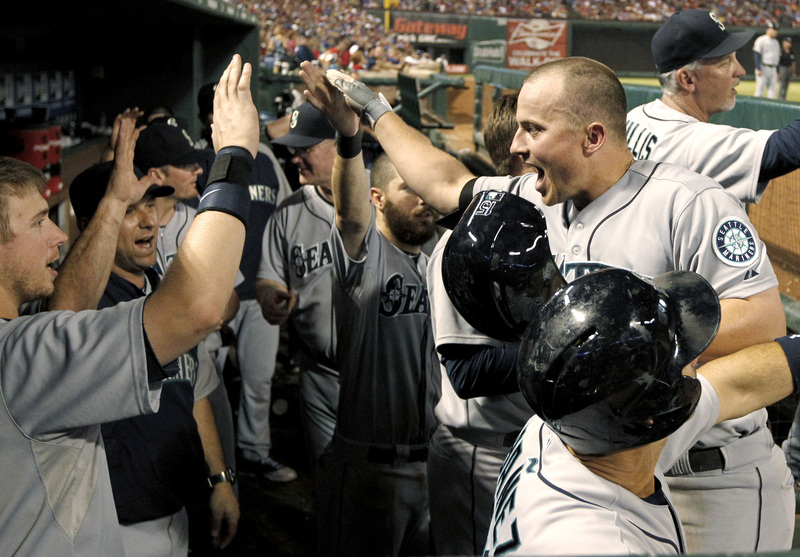 Kyle Seager is congratulated by teammates after hitting a home run last night. Throughout the season, Mariners broadcaster Aaron Goldsmith will provide content on From the Corner of Edgar & Dave, giving a behind-the-scenes look at the Mariners players and organization. Today Aaron looks back at last night’s comeback win vs. the Rangers . After a win to take the opening game of the series, this is when you especially love the 1-2 punch of Hisashi Iwakuma and Felix Hernandez. While The King hasn’t been dominant versus the Rangers this season (0-2, 4.66 ERA), he leads the A.L. with a 2.28 ERA and has a 1.05 ERA over his last six starts while walking seven and striking out 42. Saturday night Felix will square off against fellow countryman Marin Perez. The 22-year-old lefty is from Portuguesa, Venezuela and said yesterday from the Rangers dugout that his matchup against Felix “will be a pretty special day.” He went on to say that he believes Hernandez is the best pitcher in the Majors. Where does the radio crew eat on a Saturday afternoon in Texas? Babe’s Chicken Dinner House. I’m sure our review will be squeezed into the broadcast tonight. Throughout the season, Mariners broadcaster Aaron Goldsmith will provide content on From the Corner of Edgar & Dave, giving a behind-the-scenes look at the Mariners players and organization. After struggling against lefties all season (.230 vs. LHP, 27th in MLB), the Mariners made David Price look somewhat mortal. Inheriting two runners with no outs, Charlie Furbush was nails once again and retired three straight right-handed hitters. Yoervis Medina cleaned up his own mess and left the bases loaded after walking them full. The Mariners scored all four runs with two outs and Brad Miller refused to stop at first base yet again. It’s hard to get on Danny Farquhar too much after he’s been so solid taking over as Mariners closer. Making things tougher, the first three men he faced Wednesday night were the same three batters be pitched to the night before. The two runs Farquhar allowed in the ninth were his first in 14 2/3 innings — a span where he allowed just four hits. For some reason he hardly threw his four-seam fastball Wednesday night and instead actually used a changeup at least once (a pitch I can’t ever remember him throwing before). According to Fangraphs, opponents are batting .361 vs. his cutter/.205 vs. his four-seamer/.121 vs. his curveball. He once again threw a lot of cutters Wednesday. The Mariners still have a chance to start this daunting road trip with a series win before traveling to Texas to take on the 70-win Rangers.